Click the image below for full size fin templates (in .JPG format). 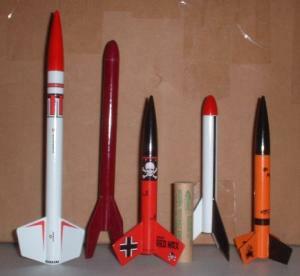 Obviously, the plastic nosecones that Estes sells are not perfect scale. In fact, for the Alpha, Goblin, and Der Red Max theyre not even close, so you may want to turn your own from balsa or hardwood. Theyre small enough to do fairly quickly. If you minimize waste when you cut the body tubes, youll have extra as well as a Mosquito nosecone left over. You could build another mini-Bertha, set it aside for a Centuri Mach-10 clone, or cut six Mosquito fins, attach them to a 4-inch length of body tube, and youve got the Ahnold Schwarzen-Skeeter. The Mosquito fin template is included with the others, just for fun. Three tables for tube lengths are provided below. 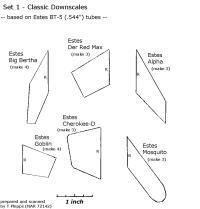 The first table shows the original dimensions. The second table shows the true scale lengths (based on table 1), and should be used if you are turning your own nosecones. 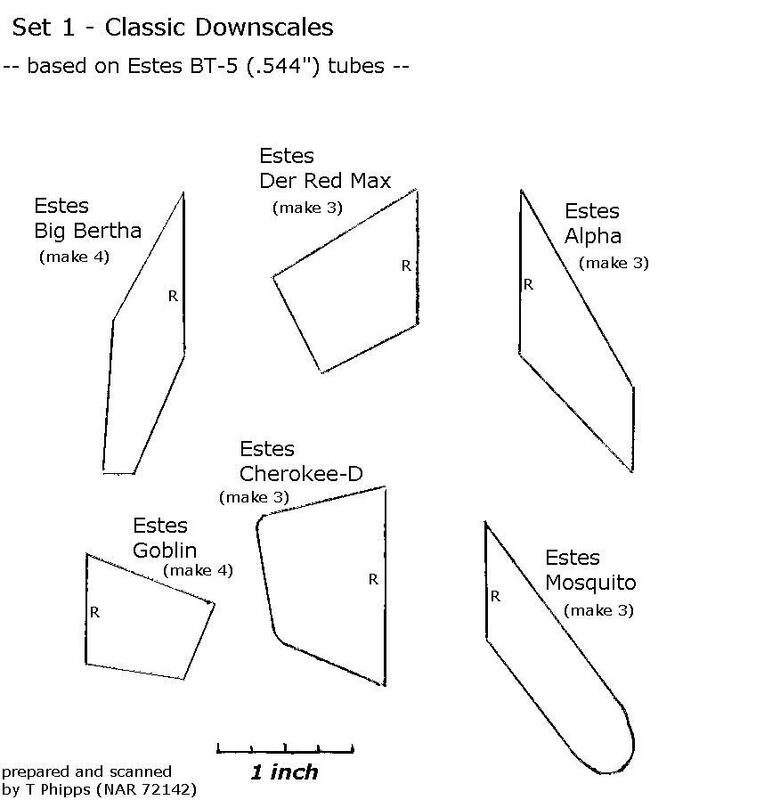 The third table assumes you are using the standard Estes nosecones, and the tube lengths are adjusted to better match the original proportions. Please note that the Cherokee-D was available in two lengths, so both are listed. 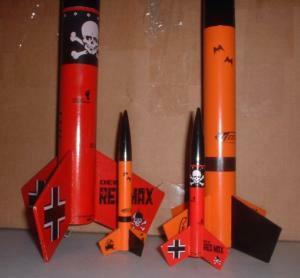 Der Red Max was also available as Der Big Red Max, and those dimensions are given as well. Also in table 2 is a column called % of Full Size. This is the scale of the rocket, and is the number that each dimension of the full sized plan was multiplied by. For example, the Big Bertha downscale is 33% as large as the full sized version. This number was found by dividing the diameter of the BT-5 (13.8mm) by the diameter of the larger tube, and rounding off to two decimal places. I used 1/16-inch balsa for all of the fins. These little screamers fly great, and give you another reason to buy 1/4As or Micro Maxxs! Table 2. True Downscale Dimensions (based on table 1).